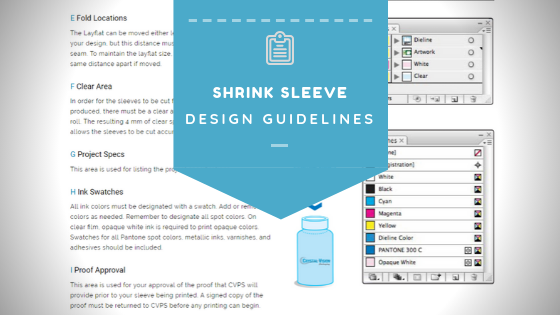 The first step to a successful shrink sleeve project is to request a dieline from CVPS. The dieline is custom-sized to your product and will serve as the design template for your project. 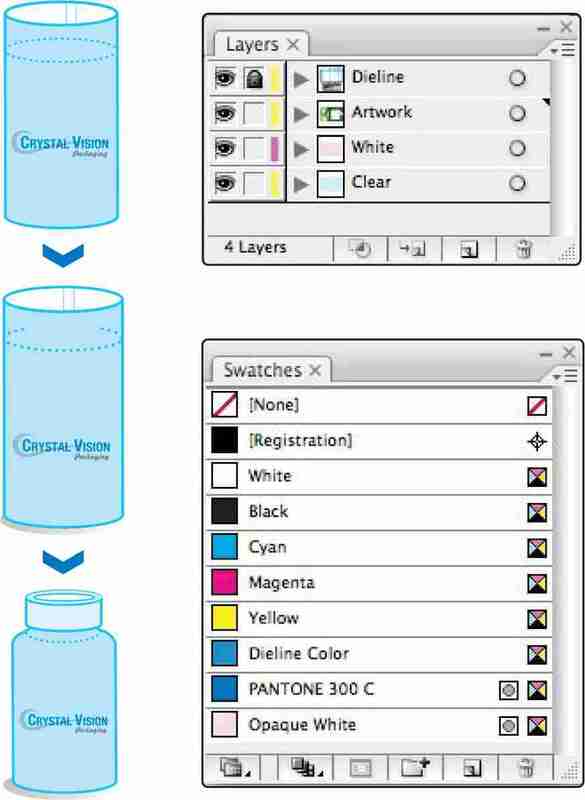 A sample container is required in order for CVPS to produce a custom dieline for your project. Your sales rep. can instruct you on submitting your container to CVPS. The dieline is provided as a PDF file that you can import into your design software and use as a template. This dieline should be placed on a separate layer from your artwork. The dieline is always provided at 100% of actual size and should not be reduced or enlarged. This is the finished width of your sleeve after it is seamed. The vertical lines of the layflat are where the sleeve will be folded. These folds can be moved horizontally across the sleeve but must remain at least 20 mm from the seam of the sleeve. This is the height of your label and includes the 2mm area of clear at the top and bottom of the sleeve. This area will be covered by the overlapping film from the opposite side of the sleeve. This area can include a background image, but should not include any important copy. The Layflat can be moved either left or right to accommodate your design, but this distance must be more than 20 mm from the seam. To maintain the layflat size, the fold lines must remain the same distance apart if moved. In order for the sleeves to be cut from the rolls on which they are produced, there must be a clear area between each repeat on the roll. The resulting 4 mm of clear space between each repeat allows the sleeves to be cut accurately. All ink colors must be designated with a swatch. Add or remove colors as needed. Remember to designate all spot colors. On clear film, opaque white ink is required to print opaque colors. Swatches for all Pantone spot colors, metallic inks, varnishes, and adhesives should be included. This area is used for your approval of the proof that CVPS will provide prior to your sleeve being printed. A signed copy of the proof must be returned to CVPS before any printing can begin. This area (shown in green) is the safe area for your copy. Avoid placing important copy outside of this area. The background image can extend to the seam edges and clear areas as shown by the pink area. Items should not extend beyond the red lines. No bleed is required. 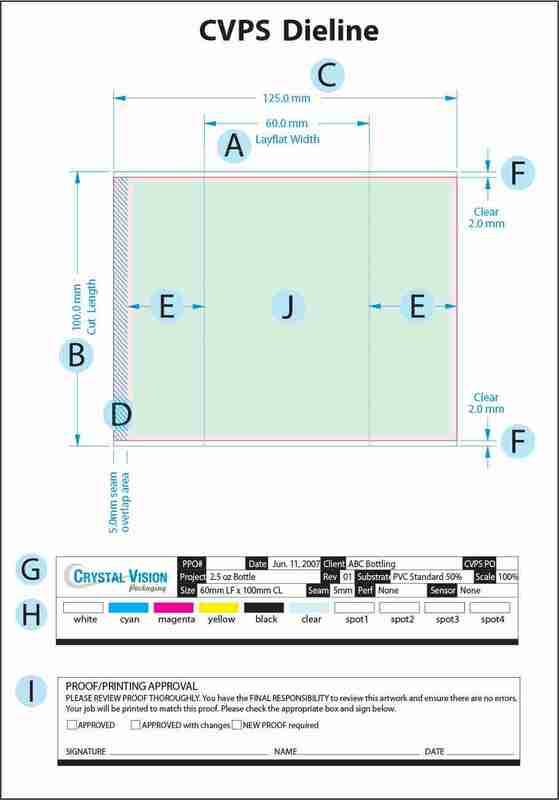 Avoid placing barcodes and important copy on the layflat folds. You are limited to 10 total plates for gravure printed sleeves. This includes CMYK Process Colors, Pantone Spot Colors, Metallic Inks, Opaque White, Varnishes and Adhesives. Use SWOP standards for process colors and Pantone (PMS) Coated Solid colors for a spot. Show all colors used as swatches on the dieline. If white ink is used as a flood of the entire print area, no white layer is needed. If white is used other than a flood, use a contrast in g color to show white ink coverage on a separate layer. Clear areas should also be shown in a contrast in g color on a separate layer. Be sure color mode is set to CMYK, not RGB. hi-res PDF files, QuarkXPress files, and Adobe InDesign files with some limitations. 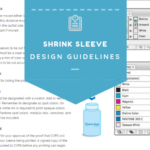 Adobe PhotoShop is NOT an acceptable format for use in printing sleeve s. It is, however excellent for editing photographic images that may be used on sleeves, but it should not be used for anything that contains type or vector graphics. Submit files as Illustrator CS6 Ai files whenever possible e. Submit a PDF proof of your artwork also. Place images as 300 dpi, layered PhotoShop PSD when possible. DO NOT EMBED IMAGES. Include placed images with the art files. Use Bitmap (1-bit), Grayscale (8-bit), RGB (8-bit), or CMYK (8-bit) modes only. Convert ALL type to curves (outline). If type changes are anticipated provide all font files with a non-outlined document. Use Sans Serif typefaces for small text. Avoid use of small script fonts that have fine serifs and swashes. All positive type must be 6-point or larger for solid (single-ink) and 12-point or larger for CMYK process type. Limit CMYK build type to 3 process colors or less. Consider using sans-serif fonts for type smaller than 10 -point. All reversed type must be 6-point or larger and boldface or heavier. Type that is thinner than boldface must have a 0.2 pt stroke added. Reversed type smaller than 12-point can only be reversed from one color and sans-serif only. No CMYK process type smaller than 16-points. Small reversed type(> 6 pt.) can be reversed out of spot colors or spot colors can be used to outline the text. Remove all extra colors from the Adobe Illustrator Color Palette. Use only CMYK colors or Pantone. Coated Spot Colors. Be sure all spot colors are set as SPOT and not CMYK. Do not use RGB colors. UPC codes and barcodes should be rotated so that the bars of the code are horizontal on the sleeve. This will help eliminate scanning errors caused by distortion when the sleeve is shrunk to the container. 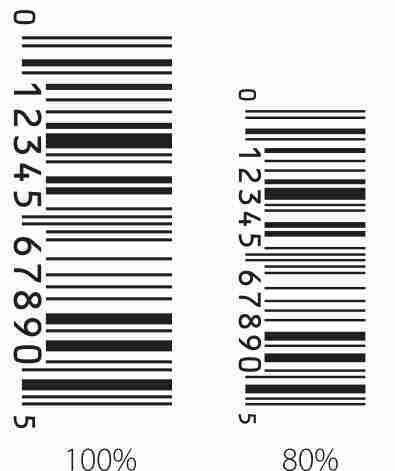 Barcodes must be backed by opaque white and the bars must be black (K) only. Barcodes must be vector artwork (lines and curves) and not bitmap image s. Barcodes can be reduced up to 80% and bar height can be reduced as needed. 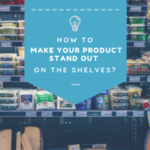 How to make your product stand out on the shelves?